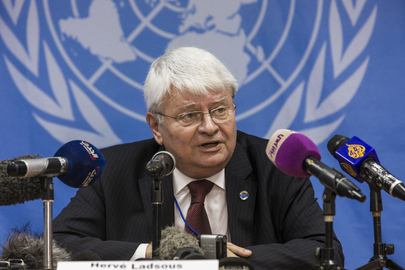 Herve Ladsous, Under-Secretary-General for UN Peacekeeping Operations; an obvious total failure. Wheres peace working? Each year the United States gives approximately $8 billion in mandatory payments and voluntary contributions to the United Nations and its affiliated organizations. The biggest portion of this money – about $3 billion this year – goes to the U.N.’s regular and peacekeeping budgets. (this info from link below). As Britain leaves the European Union so should the United States leave the UN. Of course, that won’t happen, not under Obama, nor would it under (choke) Hillary Clinton. We fund the UN more than nearly 185 other nations combined. The UN shares the same agenda as the Illuminati, Council on Foreign Relations, Bilderberg Group, of a New World Order or better put One World (global) Government; a no borders world……a biggie for Obama. Leave the UN membership and boot them out of the U.S.; remove them from the NY headquarters. Oh, and yes, the UN wants to disarm Americans, heavy on gun control, total gun control. We become slaves if this were to ever happen. Obama working hard before he leaves office for more gun control. He says he doesn’t want to take guns away from law abiding citizens………when was the last time Obama told the truth, the whole truth and nothing but the truth? He is now working hard for Hillary for POTUS, she is an extension of Obama. I believe the funds we give away, often waste to the U.N. would be better utilized by distributing ourself, for humanitarian reasons and strengthening our U.S. military. These are our tax dollars, they should be used to support us not against us. The best defense is our own self-defense; we don’t need UN troops on our soil; as they have been; they have not been here to defend but to practice taking. The UN military vehicles stockpiled, we’ll just keep where they are, we more than paid for them (remove the UN emblem). That is another story…….been there before. LET THE BUILDING HOUSE THE HOMELESS OUT OF WORK DUE TO POLICIES, ILLEGALS, CORRUPTED CEOS, REFUGEES, AND OTHERS WHO DID NOT GIVE A DAMN ABOUT US. IT IS LONG OVER DUE, THAT WE GET OUR ROYAL TREATMENT BACK, THAT WAS STOLEN FROM US FROM LOCUS. WHERE IS MY SPA ANYWAY??? If The US doesn’t get out of the UN I predict that within a couple more generations either the UN or the Muslims will be ruling The United States. I think it is time to convert the UN headquarters in New York into upscale apartments and to make the surrounding adjoining land into a public park. The UN Headquarters building would also make a great setting for a hospital funded Internationally to treat the poor. Its our freaking building, we paid for it anyway. Put it to use for Americans, and only Americans. I agree with your one hundred percent and more! Thank you for that! I am glad to see that other people think in the same vein as myself. It is comforting to know that I am not alone. I find it antithetical that a nation based on “inalienable rights” should subject itself to an organization that gives lip service to these rights, but in word and deed is about humanistic governmental control. The US, in principle, has something better to offer the world than the UN; self-government and liberty. Thanks for your post! May G-d free us from our self-imposed prisons this day! Time to throw these stinking globalists off our soil. They elect only communists as their leaders and never support freedom. Their only support is for terrorism.